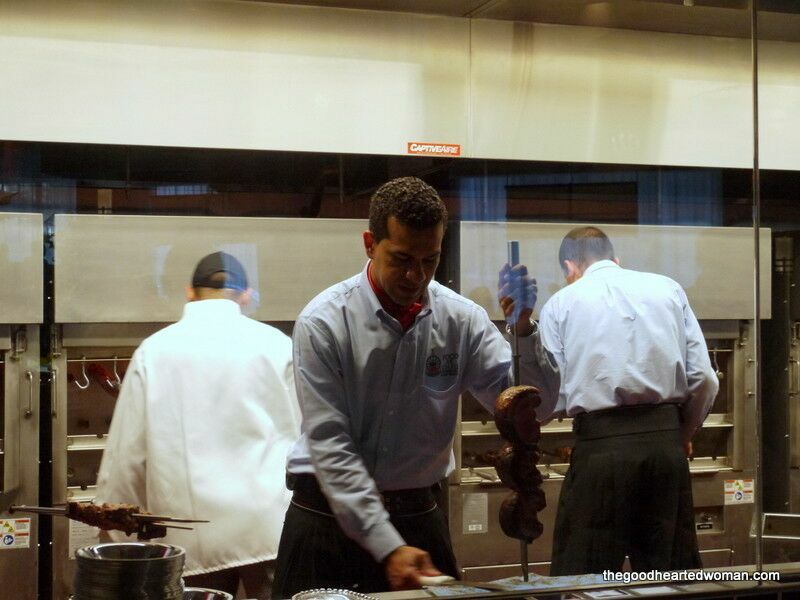 Fogo de Chão, an authentic Brazilian churrascaria, opened its doors to the public last Friday in downtown Portland. Founded in Porto Alegre, Brazil in 1979, this is the first Pacific Northwest location for the Brazilian steakhouse. Thursday evening, Mr. B and I were thrilled to have an invitation to the Grand Opening celebration. The churrascaria employs an open fire cooking technique that originated with of the gauchos (a South American term similar to “cowboy”) of Southern Brazil. They offer 16 different cuts of meats carved tableside, along with an extensive salad bar, unique Brazilian side dishes and the gaucho experience. The evening began with a few festive formalities. Jeff Miller, President and CEO of Travel Portland, officially welcomed Fogo de Chão to Downtown Portland, after which Fogo de Chão CEO Larry Johnson presented Patty Whitney-Wise, the Executive Director of Partners for a Hunger-Free Oregon, with a donation of $3,000 to help end hunger in Oregon and support the local community. Left to Right – Jeff Miller, President and CEO, Travel Portland; Selma Oliveria, COO Fogo de Chão; Alceu Pressi, Head Gaucho Chef and General Manager, Fogo de Chão; Larry Johnson, CEO, Fogo de Chão; Patti Whitney-Wise, Executive Director, Partners for a Hunger-Free Oregon. Chef Pressi cut the ceremonial ribbon with the authentic gaucho knife. If memory serves, this was my first official Ribbon Cutting ceremony, and I thought it was a wonderful way to start things off! Champagne greeted guests upon arrival. Caipirinha, Brazil’s national cocktail, is made with cachaça (sugar cane liquor), sugar and lime. Fogo de Chao’s gourmet salad and sides bar is possibly the best of its kind I’ve seen. Anywhere. Everything was bright and fresh, with great attention to presentation and complementary food pairings. It was an amazing feast of gourmet salads, fresh vegetables, imported cheeses, artisan breads, cured meats and much more. I’ll let the pictures here speak for themselves. ↑ Is that a giant platter of imported Hearts of Palm that I see hiding behind that delicious citrus salad? Well, yes it is! There is a Salad Bar Only option on the menu at Fogo de Chão, so if there is a vegetarian in your dining party, it is definitely doable. However, make sure your vegetarian friend is not particularly sensitive to the sight of meat, because it is everywhere. Mr. B and I had a very lovely table for two adjacent to a beautiful glass enclosed wine wall. (I guess that’s what you call a giant wall of wine, right?) Fogo de Chão boasts an extensive wine selection, including a number of South American wines, predominately from Argentina and Chile, and their own line of Fogo de Chão wines as well. Dinner service includes limitless service of traditional Brazilian side dishes, including caramelized bananas, crispy hot polenta, and garlic mashed potatoes. Optional side dishes of rice and black beans, and farofa upon request. Emulating the classic Brazilian dining experience through espeto corrido, or “continuous service,” the prix fixe menu is controlled by guests. You are given a small, double-sided disc – red on one side and green on the other – that signals to the gaucho chefs whether you are ready for more. Green tells them to continue service and red signals a break. You know how at some places, you sometimes feel the need to preemptively gesture to the waiter before you actually need him so that you don’t have to wait so long? My advice: don’t do that at Fogo de Chão. There will be no waiting. When you turn that disk over to green, you will have a skewer-carrying gaucho at your table-side in no time, and one right after he leaves, and so on and so on. Honestly, it was both refreshing and a little overwhelming. Picanha (Top Sirloin) is Fogo de Chao’s signature steak, and is prepared two different ways, with traditional light seasoning and a more robust garlic seasoned version. Mr. B and I tried the garlic version, and it was simply delicious. Easily my favorite cut of the evening. Filet Migon was somewhat disappointing, as it arrive far too done for either my or Mr. B’s tastes. My mother, a “well-doner,” would have loved it. Beef Ancho, a prime part of the rib-eye, came rare and juicy. Excellent. Alcatra is a special cut of top sirloin originating in the steakhouses of Southern Brazil. This was my second favorite, right after the Picanha. Leg of Lamb was perfectly cooked and delicious (according Mr. B: I don’t eat lamb) arriving just as he requested, rare and very tender. That’s only six out of sixteen, but hopefully it will give you an idea of what you can look forward to. One thing Mr. B was very impressed with was that, because the meats aren’t over-seasoned or swimming in sauces, you can taste and appreciate the natural, true character and flavors. You have complete control over what meats you have or don’t have, too. If you ask a gaucho for a certain cut of meat and he doesn’t have it, he will be quick to let the right person know, and they will be at your table almost immediately to help you. One of my favorite PDX Food Bloggers, Bee ( The Spicy Bee ) enjoys a glass of wine with her meal. Because the gauchos are constantly on the move going from table to table, the space is a beehive of activity. Fogo de Chão would be a wonderful destination for a special birthday or family celebration, but I think I would choose a different spot if I were hoping for an intimate candlelit moment. After all that food, we didn’t think we had an inch left for dessert. But then the Table Captain told us what our choices were. Mr. B had Fogo de Chão’s Signature Papaya Cream. Smooth with just the right amount of sweetness, this luscious dessert is topped off with a generous pour of Crème de Cassis, a sweet, dark red liqueur made from blackcurrants. I opted for the Crème Brule, which was, in a word, Perfect. 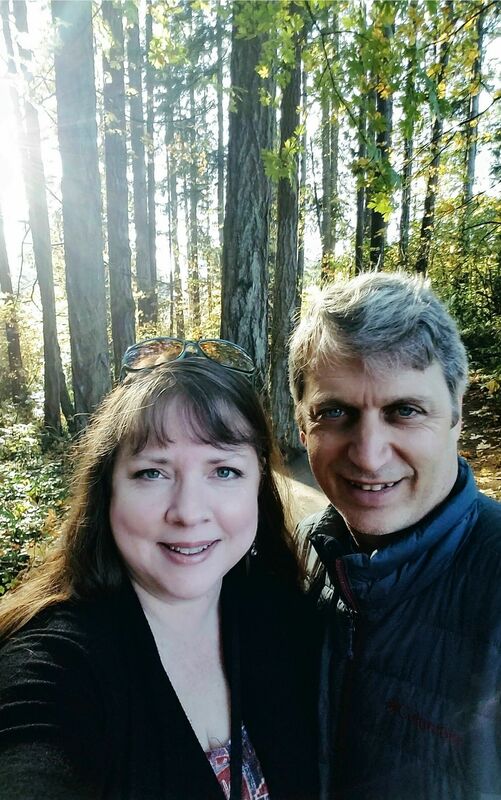 Opening night at Fogo de Chão in Portland was as memorable as it was delicious, and Mr. B and I were both most grateful for the opportunity to attend. Children 6 and under are complimentary. For reservations, go online or call 503.241.0900. Be sure to stop back in and let me know how you like it when you go! Disclosure: Mr. B and I were invited to the Fogo de Chão Grand Opening dinner and our meals were complimentary. Free food notwithstanding, we will always provide our honest opinion. The views and opinions expressed on this blog are entirely my own (and occasionally Mr. B’s). Great photos! All I got was a lot of reflection trying to take a photo of that wine wall, so mad propz for your skillz. I’m a veggie so the 16 cuts of meat don’t particularly tempt me, but the salad and sides bar looked delicious! Great photos. I attended this event as well, and all I can ask is…Are all of the Fogo employees models? Holy Moly! My friend, I was salivating through the entire post! That would be quite an experience! That looks amazing!! Especially the wine wall! My husband has been telling me about a place just like this in Utah that he loves! All of that looks so good! Wow! What an amazing night. I love how the Portland area food industry has embraced food bloggers so well. That’s such a welcome change! Thanks for this review. I know nothing about South American cuisine, but would like to. The food looks so clean and fresh.